Shogen Andy, your Winter 2018 SZBA Newsletter is here! For enhanced viewing, click "View this email in your browser" at top right. Your email program may clip this newsletter because it is so long. Click "View this email in your browser" to view the entire newsletter. Can't see the images?! You may also need to ask your email program to "Display images below." At the end of this Rooster year and the onset of the Year of the Dog, I am excited to step into the role of SZBA President and to share some of my ideas with you. We are living in challenging times, with hate and intolerance on the rise. At the end of 2017, in Northern Westchester County, New York, I attended an interfaith gathering in response to yet another hate crime in the area. This gathering was one of many interfaith clergy-organized events I have attended since November 2016. Standing in the crowd as we lit Shabbat candles, I felt a palpable sense of heaviness and grief among the people around me. It struck me as very similar to the energy at a funeral. This sense of heaviness imbues the world around us these days, even as people split further into “us and them.” People share feelings of hopelessness and despair with me more than I have ever heard before. As heavy as the world feels though, our Zen training provides us with the capacity for being with people in such grief, and for being in such grief ourselves. Our Zen training provides us with the skills to hold heaviness without shying away and to help people understand that there is no “us and them” in the Dharma. Our temples, our communities, and the world need us to bring our training and skills to the exigent circumstances of hate and intolerance all around us, starting with ourselves and our own Zen communities, where the hate and intolerance is much more subtle and harder to see. While Zen practitioners don’t typically march in the streets of Charlottesville holding torches and chanting, “Jew will not replace us!” we can do more to ensure that all sentient beings benefit from the Dharma treasure by examining the ways we unintentionally keep people out. As we all know, the place to begin working with hate and intolerance is within ourselves. Many of our SZBA communities have been holding trainings on a range of issues including: implicit bias, racism and white privilege; the environmental implications of our greed for fossil fuels; and gender discrimination, undoing patriarchy and sexism. We have been teaching our members how to be in conflict skillfully and how to practice Right Speech. Some of us participate in marches and social actions and some hold a still, safe space for those who do not march, focusing more on internal change than social change. All of these trainings are fed by the core teachings of Buddhism and align with the Standards for SZBA Membership. As we move ahead, the SZBA intends to offer more priest trainings on an organizational scale, in collaboration with you. If your Sangha is doing priest training you feel will benefit others, please let us know about it. As a spiritual leadership organization, we also have to address more subtle issues internally as we help our communities deal with the realities of the external world. For example, at this time, there are slightly more men than women in the SZBA (full members 47% women, associate members 45% women). However, when we look at full members aged 55 and under, the percentage of women drops to 20% (41% for associate members). We are deciphering the reasons behind these numbers, but they point to a troubling future deficit of female leaders. Likewise, we lack information on SZBA members who are not white, but best estimates indicate there are about 4%—a shockingly low number. If Soto Zen Buddhism is to continue and to be relevant, these trends must be reversed, and we are responsible for laying the groundwork to do so. If “together with all beings” does not include people of color, women, and every single sentient being, then we are not fulfilling our vows. As Soto Zen priests, we care for Soto Zen forms, practice, and temples. We embody forms we have learned and absorbed through years of dedicated practice, and we provide places for people to practice Zen together. We provide a still space—internally and externally—for people to bring their grief and anger, to drop away body and mind, and to be vulnerable as we join together in our joys and sorrows. We are the holders of the Soto Zen tradition. This is a lot, and yet, what else are we? In the coming year, the SZBA board plans to explore this question with our members and Zen communities. In an anonymous survey, we will be asking your communities: “What do I want/expect from my Zen priest?” We will be asking you: “When the SZBA feel most vibrant and alive to you?” and “What possibilities do you envision for a more vital, successful, and effective future?” What are we doing well? And where could we use a little improvement? A demographic survey of SZBA members will help us better understand who we are as a group, and focus groups will help us better understand particular issues facing our members. The SZBA board received your message that having common standards is important, with 84% of you voting in favor of the SZBA Membership Standards. As the board begins to implement these standards, we depend upon your voice. It is critical that we engage with you, that we hear and discuss your views on what it means to be a priest, on training priests and laypeople, and on the trajectory of Zen in the West. And we ask that you do the same with your colleagues, as well as the board. We look forward to consolidating the viewpoints, balancing the needs and interests of priests and the communities they serve, reporting back to you on an ongoing basis (in person and via newsletter updates), and feeding all of this critical information into a multi-year strategic plan. We will make this plan together, with our Bodhisattva vows as our guide. As the board explores and listens, we intend to bring our associate members more actively into the conversation. Associate members represent the future of Zen in the West. Providing trainings to associate members on everything from Zen forms to healthy boundaries to the teachings of Dogen Zenji to working with trauma; hearing associate members’ dreams and views; and helping them get to know, appreciate, and support each other across lineages will give them a strong base for the challenges they will face as Zen leaders. We must do everything we can to help them thrive now and in the world to come. Our associate members do not represent some future idea of Soto Zen—they are part of the continuous flow of Zen practice that is not separate from us right now. If we expect SZBA associate members to be able to meet both the Required Standards, and the equally important Recommended Minimum Standards for SZBA Membership, current full members need to work hard to support them in doing so. Likewise, we should encourage each other to model great leadership by taking the initiative to lean in and improve our own practice skillset, especially in those areas of the Standards where we know—in all candid self-evaluation—there is room for us to improve. In this way, we can ensure the continuance of Soto Zen in the West, no matter what our age or status. Board members have taken on personal commitments to do so and we hope others will do the same. Hopefully, you will join us in continuing these discussions face-to-face at the 2018 SZBA Conference. 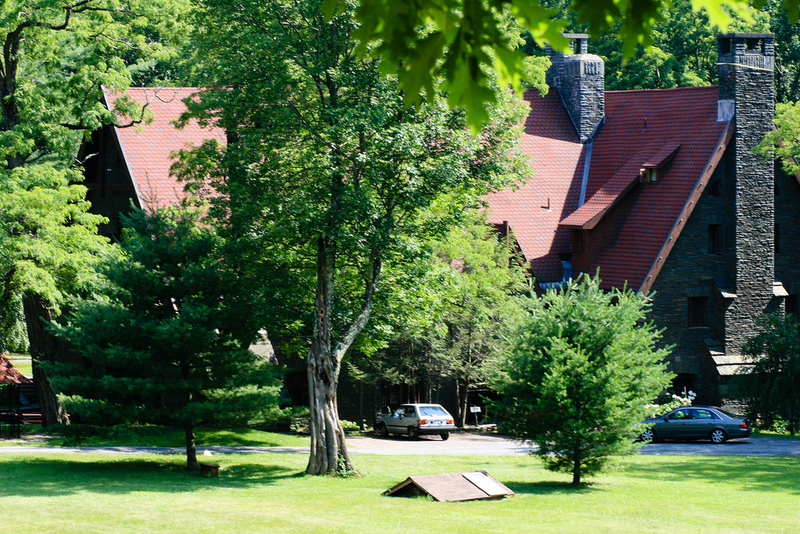 We are delighted to announce that it will be held at Zen Mountain Monastery, September 19-23, and already appreciate their kindness and generosity in hosting us. Coming together in person is the best way to appreciate the great diversity among Zen practitioners in the West, and also the best way to appreciate our myriad commonalities. We intend to dive into some of the deep and uncomfortable questions concerning Soto Zen in the West even as we celebrate and learn from each other. 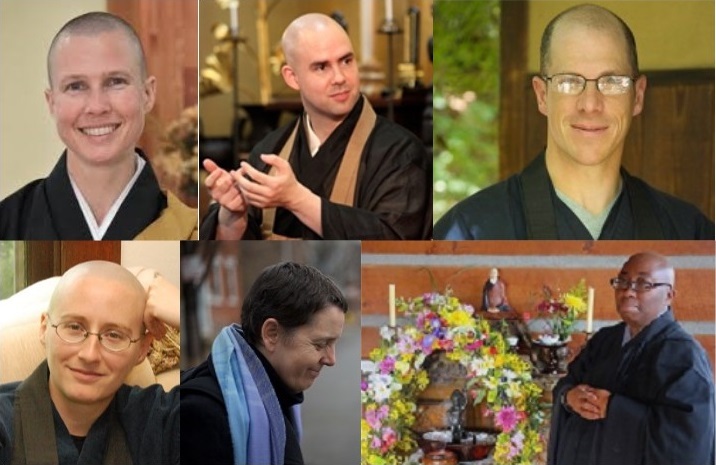 Starting each conference day with zazen together in one of our beautiful and historic American Zen monasteries offers the very best way to truly know each other. For this alone, the conference is worth coming to, and yet there will be so much more. If it sounds ambitious to get a lot of these multi-year, sometimes challenging, endeavors underway it’s because it will be, especially for a volunteer board. We will need your input to prioritize. It will also require a modest increase in membership dues—which the board has not increased in over eight years. While we strive to stretch every dollar as far as we can, we have to keep up with increasing expenses and support the future needs of a multi-year strategic plan focused on priorities you will help set. The times ask for our actions, not just words. To jump-start the creative process, the SZBA board welcomed three new members in November: Chimyo Atkinson, Charlie Pokorny, and Peg Syverson. We also saw a change in leadership, with Jyoshin Clay stepping in as Secretary, Koun Franz becoming Vice-President, and me as President, enthusiastic to get started on all of the above. Finally, I would like to express gratitude to the board members who recently stepped down: Hozan Senauke (5 years), Mary Mocine (3 years), James Ford (3 years) and Musho Hamilton (1 year). We are deeply grateful to them for the hard work they did to make the SZBA a stronger organization. Thank you. We are living in challenging times. In contrast to previous eras, the stakes are higher, the pace is faster, and intolerant behaviors more egregious. We can’t solve every one of our country’s problems, but we can make efforts to be fully present to them without looking away, as our Zen ancestors teach us to do. We must double-down on compassion and wisdom, on being upright and on Right Speech. We must slow down and meet each Buddha where they are, speaking and modeling the truth of interconnectedness. And we can make efforts to be more visible in our unity, even as we continue to appreciate our differences. First of all: thank you. At our SZBA board meeting at Berkeley Zen Center earlier this month, I completed five years on the SZBA board and a two-year term as board president. Leadership now passes into the able hands of Tenku Ruff, with Koun Franz serving as vice-president. As I leave the board, I feel honored to have had your friendship and support over the years. These relationships and the shared practice of our Soto tradition have sustained me, even when we have differed over particulars of our vision. Thinking back, I want to honor all of those I have had the privilege of working with on the board since 2012: board members Domyo Burk, Jyoshin Clay, Ryushin Creedon, Shotai De La Rosa, James Ford, Koun Franz, Musho Hamilton, Daijaku Kinst, Myo Lahey, Daishin McCabe, Ejo MCmullen, Mary Mocine, Taihaku Priest, Tenku Ruff; administrative coordinators Korin Charlie Pokorny, Domyo Burk, Connie Cummings, and Shogen Danielson. I welcome our incoming board members: Chimyo Atkinson, Korin Charlie Pokorny, and Peg Syverson. During my entire time on the board, we —the organization as a whole, and the board—were engaged with the creation of training standards for full membership in SZBA. This was not always an easy process. I continue to think about the path of my own training over nearly thirty years as a Zen priest, and what skills and training serve those who are coming along on this path. 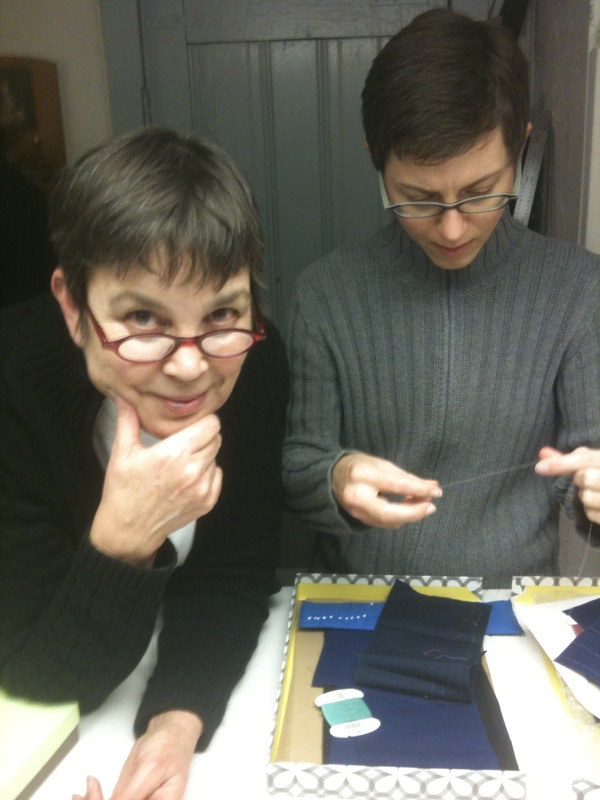 Although I have had intervals of monastic training in the U.S. and in Japan, the largest part of my practice has been in residency at Berkeley Zen Center, living with my family, my teacher, and community. Training arose in the course of everyday practice. When members married, I learned how to do weddings. When members died, I learned about funerals and memorials. When the sangha experienced loss, we found ways to hold each other. When our nation suffered, we found ways to come forward to listen and respond. Again and again, I return to Case 14 in the Blue Cliff Record. In this life of suffering and joy; in our fragile environment, vulnerable to our driven human hungers; in a nation unhealed from wounds of racism, sexual oppression, and bitter violence, what is an appropriate response? With all the riches bestowed by our teachers, how will we as priests and teachers meet a world of boundless need? What future will we leave for our students and our children? I hope we can continue to meet these questions together. Take the Board Member Quiz! As of November 2017, board members Alan Senauke, Mary Mocine and James Ford, stepped down and new members Peg Syverson, Charlie Pokorny and Chimyo Atkinson took their seats. To learn more about these new board members and the continuing members you may have yet to meet, Take the Quiz! Two statements are true and one is a lie, can you guess the lie? If you take this fun quiz, you might be pleasantly surprised. Proposals or Questions for your Board? The SZBA Board is committed to listening to the membership and responding. Email your input to the SZBA coordinator at coordinator@szba.org. The Board will consider whether/when to put the item on the agenda for an upcoming board meeting. Board meetings are held about every 6 weeks, so please be patient and thank you! If you want to learn more about your SZBA board members, click here for their profiles. Have you made your New Year’s resolution? We did! The SZBA board is excited to announce we will soon change the SZBA discussion platform to Google Groups forum. Google Groups is a collaborative space for online discussions around any topic. The forum will allow you to sort or view discussions based on individual topics (threads) and limit the number of emails arriving in your inbox to only those topics that interest you. (Don’t worry, you can still sign up for all topics if you want to.) Look for an update with more specifics soon. Please note that some pages on the SZBA website are password protected. log on with username buddha, password dharma. Once you log on, all of the password protected links will work for you. We are pleased to announce that the 2018 SZBA National Conference will be held at Zen Mountain Monastery in Mt. Tremper, NY. The main conference will begin with dinner on Wednesday September 19 and will end the morning of Sunday September 23th, 2018. For the first time, there will be an additional pre-conference day for all Next Generation SZBA members 55 years old and under. The day will begin with dinner on Tuesday, September 18, 2018. All full and associate members age 55 and under are invited to attend. Keep your eyes out for a separate email with registration information. We hope you'll be able to join us for our biennial gathering to share and connect on our paths as Soto Zen priests! I only met her once. But, I’ve admired her for ages. Junsei Jana Drakka died on died on October 28, 2017. She’d just turned sixty-five. She had been suffering from lung cancer, and had been in hospice since late July. Jana was a street priest, one of the first American Zen priests to take our ministry to the homeless. Jana spent her Zen life ministering to the lost and left behind. Her ministry, called by many the “Zendo without walls” brought her to homeless shelters, hospices, and low-income hotels, and especially SROs, “single occupancy residences.” She tended to people, she accompanied them. At the peak she was leading five different sitting groups for homeless people. Along the way she conducted more than a hundred memorials for individuals who had been occupying those dreary single occupancy units in the poorest parts of San Francisco. And, yes, there are poorest parts. A Scottish native Junsei first kicked around Europe and then settled in America. After a disastrous affair she found herself homeless. And then found as part of that a calling to honestly explore her own life, to fully own who she was, and from there to act as best she could in this world. At forty Junsei entered the San Francisco Zen Center. There she trained. 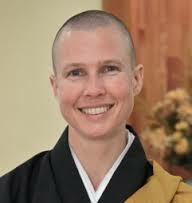 She ordained in 2001 and in 2009 received Dharma transmission from the equally remarkable Blanche Zenkei Hartman. Junsei Jana Drakka passed away at 9:16 p.m. She was lucid throughout the day until she went into her final contemplation. 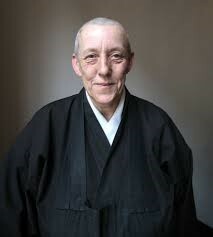 Several of her students and I gathered at her bedside to sit zazen and consider the Great Matter so clearly reflected in the serenity of her expression. Jana wanted you to know that loving you was a great joy in her life. Like her teacher, Zenkei Blanche Hartman, she felt that kindness is one of our most important practices. She said, 'There is never such a thing as too much love.' This is a basic realization that has sustained her in the past difficult days, freeing her to do her inner work despite the pain. I find Junsei one of those people who tell us what it is we can be. An out lesbian, someone who smoked way too many cigarettes and lived a bit too hard, she liked to comment that she was glad she came to Zen a bit later in life, so she had lots of living under her belt before the monastery. And with everything that she brought to the project, rejecting nothing, but with that becoming something new, she became someone who reveals a critical aspect of the Zen way, of the dharma of presence. She showed us how we can be we who we are and how that can in fact be enough. Middle Way Zen is a small Soto Zen group in the lineage of Suzuki-roshi, located in San Jose, a densely populated urban area south of San Francisco. The Bay Area as a whole is a high-energy place with tremendous resources in diverse spiritual practices, teachers, sitting groups, educational opportunities, events, and lectures. The group consists of a stable core membership of 8-10 people, and a few more who come when they can. We sit zazen at 5:30 in the morning, Monday through Saturday. We also meet on Thursday evening, including a dharma talk and an opportunity for attendees to ask questions about practice. Thursday evenings are a bit less formal, intended to be more of an entry point for newcomers. Middle Way Zen occupies a wonderful, dedicated space in an art center where actual living artists have their studio and place of work. It is an ideal environment for a Zen center, given the affinity between Zen and art. Middle Way Zen is looking for a priest, preferably transmitted or close to transmission, who would be interested in leading the sangha into the future. It would be someone who is grounded in Buddhist practice, preferably in the Suzuki-roshi tradition, but not necessarily so. It would be someone who is thoroughly familiar with teachings and ceremonies and can “translate” formal practice and teachings to address the concerns of lay people. In a small lay sangha, the primary task of the teacher is to make the Buddhist teachings relevant to people who have family, job, sick relatives, and so on. The present group is too small to support a teacher full-time. An incoming teacher would either have his/her own means of support or find employment, perhaps part-time, in the South Bay area. Some temporary support could be “cobbled together” from various sources until the new teacher gets his/her feet on the ground. As a non-residential group, nobody lives at the center. The new teacher would initially have to find an apartment nearby. Change can bring excitement and energy to the group. For a new teacher to be successful at Middle Way Zen, it will take a person who is energetic, creative, and not intimidated by some difficulties along the way. People want to help and be involved in the further development of the Center. It can be a new beginning for the group, if the new teacher has the confidence that he/she can make it work. If you would like to further explore this opportunity, please email cornelia707@sbcglobal.net. A new book aimed at clinicians and researchers includes chapters from Shohaku Okumura ("What is Zen? The Path of Just Sitting"), Shoryu Bradley ("Zen and Forgiveness"), Rosan Yoshida (“Zen and Science: Zen as an Ethical Guideline for Scientists' Conducts”) and Josh Bartok (“Remembering-and-Receiving: Mindfulness and Acceptance in Zen”). 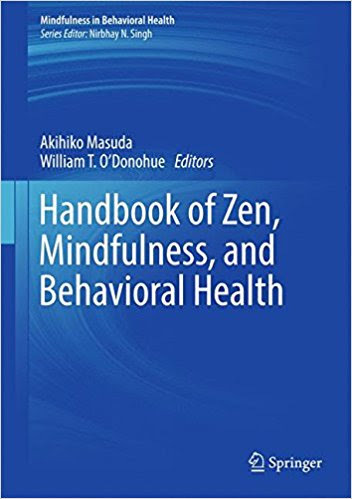 According to the publisher, Handbook of Zen, Mindfulness, and Behavioral Health "presents a Zen account of fundamental and important dimensions of daily living. It explores how Zen teachings inform a range of key topics across the field of behavioral health and discusses the many uses of meditation and mindfulness practice in therapeutic contexts, especially within cognitive-behavioral therapies. Chapters outline key Zen constructs of self and body, desire and acceptance, and apply these constructs to Western frameworks of health, pathology, meaning-making, and healing. An interdisciplinary panel of experts, including a number of Zen masters who have achieved the designation of roshi, examines intellectual tensions among Zen, mindfulness, and psychotherapy, such as concepts of rationality, modes of language, and goals of well-being. The handbook also offers first-person practitioner accounts of living Zen in everyday life and using its teachings in varied practice settings." A new book of teachings from Dainin Katagiri Roshi, founder of the Minnesota Zen Meditation Center, is being released on November 28. 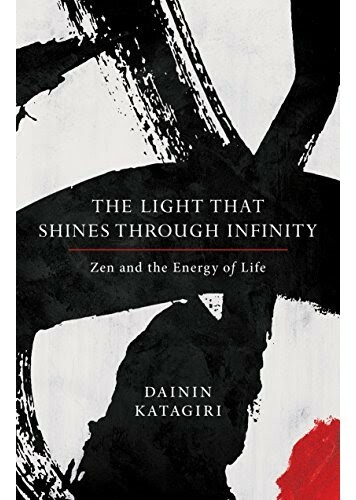 The Light That Shines through Infinity: Zen and the Energy of Life presents a Zen Buddhist perspective on the universal flow of cosmic energy and how to incorporate that energy into one's life and spiritual practice--from one of the most revered figures in American Zen. The universe is alive with a dynamic energy that creates and sustains our lives. It surrounds us, flows through us, and is available to us in every moment. Spiritual practice, according to Dainin Katagiri Roshi, is about aligning ourselves with this ever-present life force--sometimes referred to as chi, qi, or ki. This collection, edited from his talks, focuses on cosmic energy as it relates to all aspects of Zen practice. With references to classic texts and personal stories that bring the teachings to life, The Light That Shines through Infinity is also a powerful antidote to the notion that practice is in some way about transcending the world around us. It is in fact about nothing other than relating to it compassionately and whole-heartedly. Kobun Chino Otogawa was an instrumental figure in the transmission of Zen to America and its evolution within our culture. Sent from Eiheiji to bring the classical forms of Zen to the First Monastery in America, Kobun arrived as a young man in the midst of a social revolution and resonated in perfect time with the evolution of American Zen. With a refined ability to embody form and a deep belief in Buddha Nature - that the Buddha has no body but ours, Kobun taught Zen with intuitive jazz-like creativity. Although he came to assist Shunryu Suzuki at the San Francisco Zen Center, Kobun was enamored of the way Zen, unfettered, blossomed in new soil and he followed it wherever it grew. For Kobun, Zen was not an institution, but the elemental nature of every aspect of our lives and existed in myriad forms. 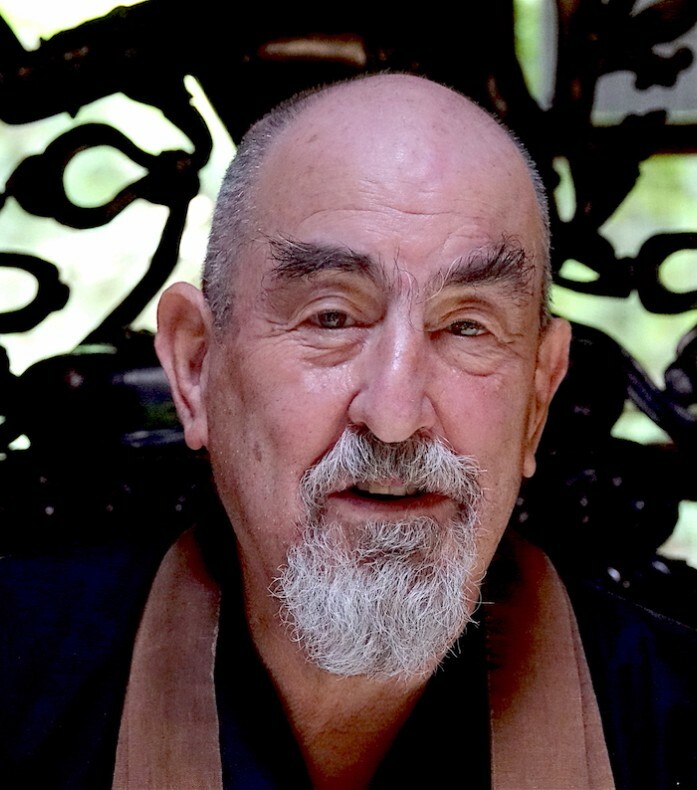 Kobun founded four temples, taught Buddhism at Stanford and Naropa University, demonstrated and taught Calligraphy and Archery, spoke at events, met with sitting groups in their living rooms and hiked the wilderness with the people he encountered. When Steve Jobs founded Next Computer, Kobun was listed as it's Spiritual Director. However Zen spoke to a person, be it as a religion, a practice, an aesthetic or a guiding principle, Kobun wholeheartedly believed in Buddha Nature and followed each path with creativity and grace. 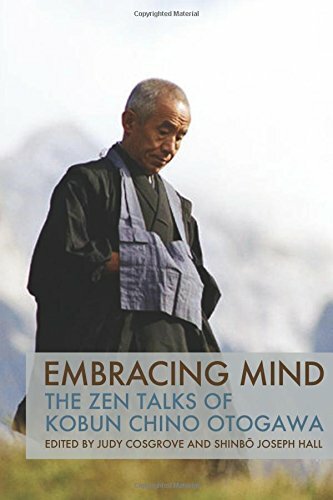 The wide ranging talks in this book began as Sesshin Teishos - instructions given to students while in the midst of a week-long period of intensive sitting. Together, they offer an insight into the Zen of Kobun Chino Otogawa, containing both his perspective on the forms and his emphasis that Zen is revealed not so much in the sutras as it is in the everyday. "Here is a [short story] collection in which every person, animal, tree, spoon, and stone is capable of burning with love and grief, losing itself in transports of joy and wonder, succumbing to illness, quaking with desire, and breaking and being broken by every other. Rutschman brings a wonderful grace and suggestiveness to both the longest and the shortest of his stories, and as a result he has made a book that deserves not only to be read but reread." 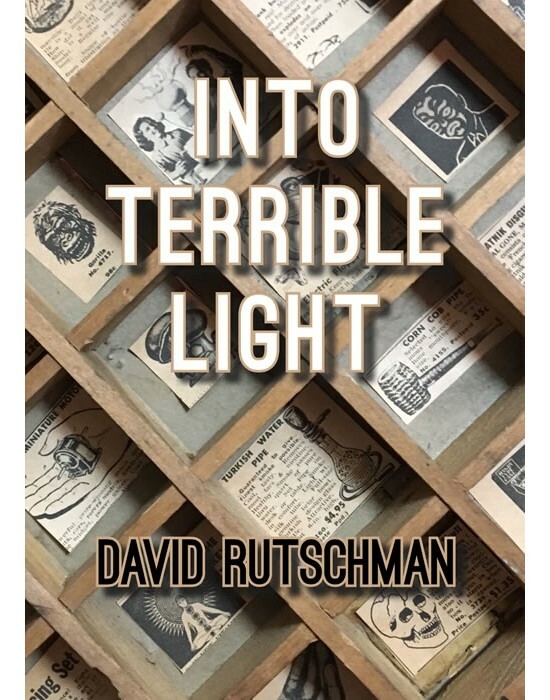 "David Rutschman’s INTO TERRIBLE LIGHT has brought a whispering, uncontainable fire into our world." David Rutschman is a Soto Zen priest and hospice grief counselor. His work has appeared in Forklift, Ohio; Kenyon Review Online; The Massachusetts Review; The Sun; Waxwing; Witness; and elsewhere. He lives in California with his wife and two young children. This is his first book. If you have a similar skill or talent you would like to offer for the benefit of SZBA members, please email the SZBA coordinator so we can include your offering in future newsletters. 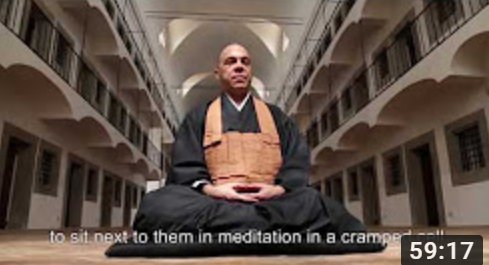 "The Inner Way - Meditation in Rebibbia" is a documentary of the first zen meditation course offered in an Italian prison. Led by Dario Doshin Girolami for more than eight years, Dario has been teaching in Rome's largest prison to 20 inmates. Images, words, sounds and silence accompany Dario’s narration, his questions to the inmates, their answers, and their accounts of past and present experiences, and future expectations. A future sometimes forever linked to the prison walls but, thanks to the meditation, not so unbearable. In Italian with English subtitles. Click below to view the video on YouTube. Long Beach Buddhist Church (established in 1957) has been carrying out Chow Mein (Asian fried noodles) fundraisers twice a year over 50 years. We charge $10 per plate and sell about 800 plates each time. 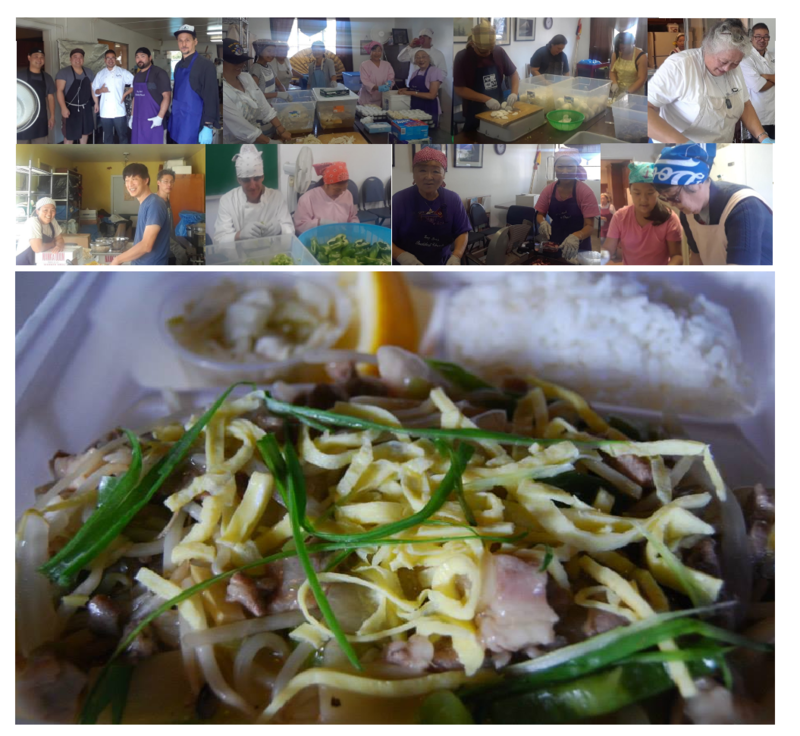 Although this Japanese-American Buddhist church has lost a significant number of members due to demographic change of the community and religious assimilation, former members and their children still come back to support the church and enjoy the same flavor that hasn't changed since the church was founded. In fact, because we have been doing this for such a long time, many families have made it a tradition and bring their children and grandchildren. Our Chow Mein is exceptionally tasty thanks to the knowledge of a few amazing ladies from Japan who have maintained this flavor for half a century so that people now cannot live without it. Thanks to these fundraisers and few smaller fundraising projects, the church can have a residential priest and continue to renovate the old buildings of the church. But more importantly, this labor intensive fundraiser strengthens the ties of the community. News - Major news about things like new temples, abbots/guiding teachers, etc. Events and Opportunities - In the interest of space, listings are limited to events and opportunities of special interest to priests, or that provide an aspect of priest training that members may not have available in their area. Shared Best Practices - Successful innovations or fundraising approaches; ways to be more environmentally responsible; successful approaches to involving/supporting youth, families, elder members, etc. Submit announcements at any time to coordinator@szba.org. Listing here does not imply any endorsement by the SZBA. Copyright © 2018 Soto Zen Buddhist Association, All rights reserved.